Every domain you buy comes fully loaded. Domain name, URL, web address. Whatever you call it, it's the core of your web presence, so choose wisely. You'll get a unique, stand-alone domain - none of this www.youridea.crazydomains.com crap you see elsewhere. 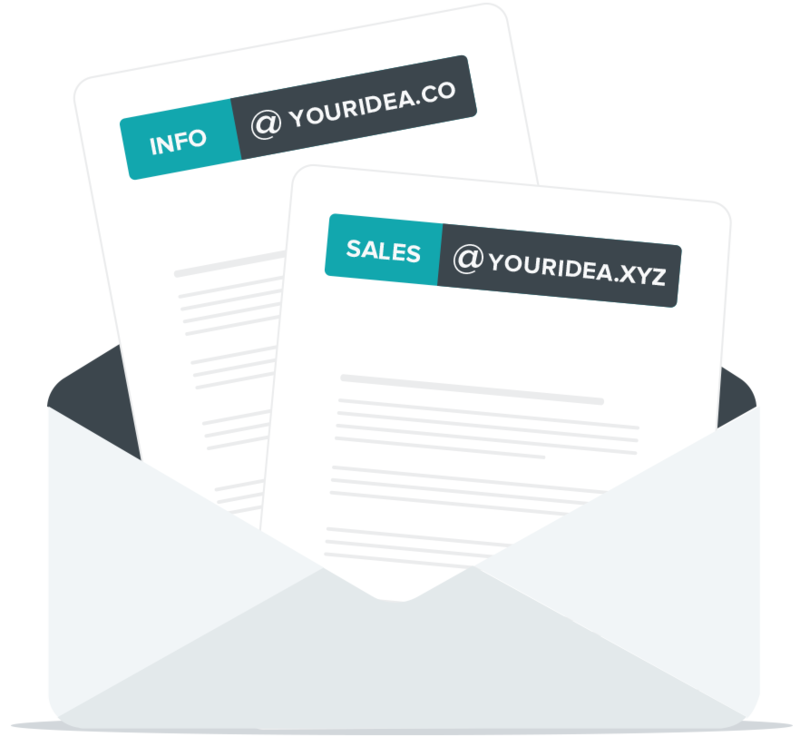 Just youridea.co, so you look professional. Choose from .CO, .COM, or any one of our 150+ domain name extensions for your business. In addition to legacy domain extensions (like .com and .net), these newer extensions have lots of great naming options available for you to use for your business today! Sometimes your idea just doesn't work out. With traditional domain registrars, you get stuck with domain names for long periods of time, even after you don't need them. With POP, you can cancel at any time with no obligations. With Full Domain Control, you can do whatever you want: create and delete DNS records, forward your domain elsewhere, transfer it, and more. With POP, you get your own email address immediately set up with Simple Mail – our free email platform of choice. Just pick your address. We’ll set it up for you, so all you have to do is log in and start emailing. Show off your new professional email to everyone: your old boss (I quit! ), your mom, or neighborhood birds, if birds used email. Check your email through any browser. Except, like, Netscape. If it’s your jam, you can also use apps like Outlook on the desktop. And you can use it on your phone, too. Add more users and mailboxes at any time. Syncs to your phone, Outlook, whatever. Schedule meetings, check your coworker’s schedules, and do other things that calendars do. Even add reminders, so you don’t miss your court date. Create and manage your contacts and groups from any browser, mobile device, or email app. check out our add-ons page. Ball out with Google Apps for Work for yourself or business. We built tools so you can fully manage Google Apps users, groups, and alias/forwarding within POP. For $5/month, you can upgrade your email to Google Apps. Google Apps is so powerful, it makes unicorns jealous. It’s far more than just email: you get a full-service suite of sweetness for team or business collaboration. Just pick your email address and we automatically set it up! Oh, and did we mention 30GB of storage for each user? Harness the power and simplicity of GMail, with an email address using the URL you chose. Access your email through the world’s favorite email interface. For every email address purchased, you can create up to 20 email aliases for forwarding. Google Calendar makes setting up a meeting and managing deadlines feel like relaxing on a bed of feathers. The collaboration station. Create, edit, and share word documents, spreadsheets, drawings, presentations, and uploaded files with multiple team members simultaneously. Want more details on email, storage, and whatnot? Check our add-ons page comparison. It's called Simple Page because it's so damn easy! You only get things done if you start doing them. We help you get started really, really fast! 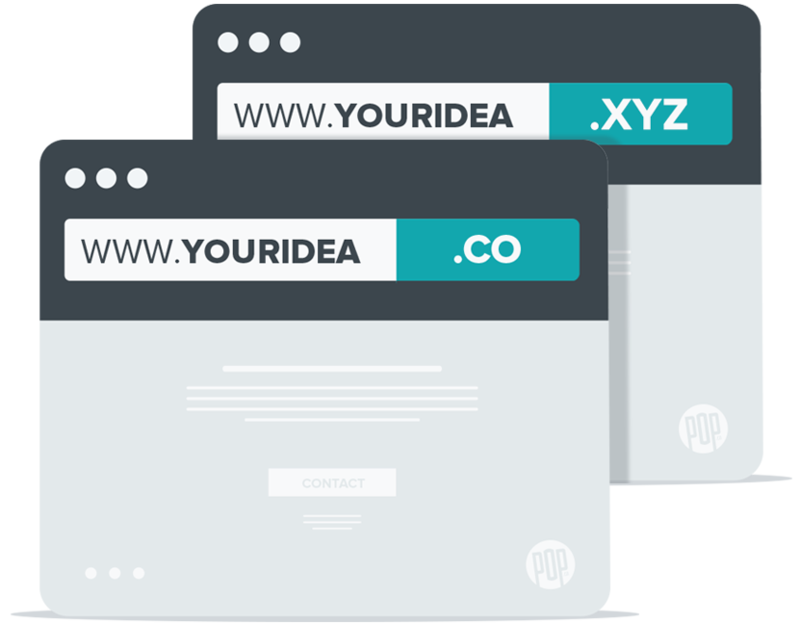 As soon as you pick a domain name, your webpage is created. Just customize it and push a button to set it free on the wild open pastures of the Internet. 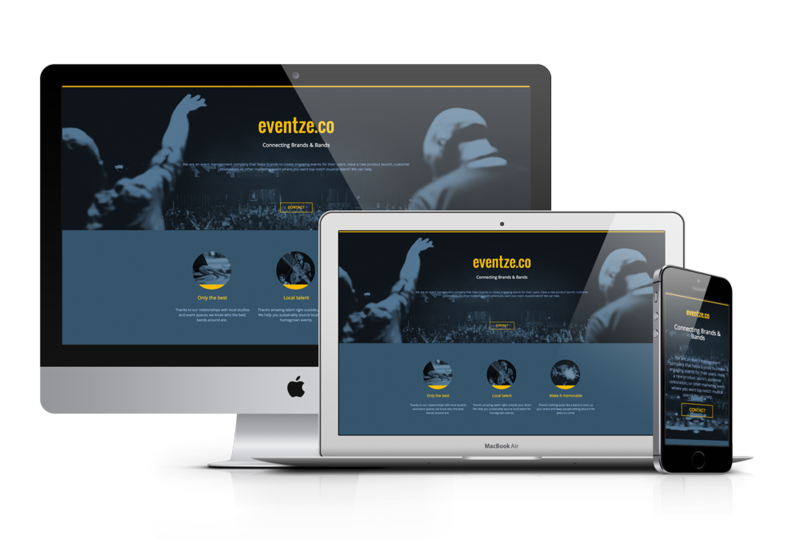 This single, one page web page will be the home for your business or personal site as long as you want it. Make it reflect your idea by customizing the background image, color scheme, social networks, and more. Your webpage will look crazy good on the newest iPhone, your cousin’s tablet, and on a regular old desktop. We love all our toys equally. That's why we've built all themes and blocks to be responsive. Who’s checking out your page? Are you getting more visitors? You can easily add Google Analytics tracking to your page so you can make business decisions based on metrics, not guesses. One love for KPIs. If you need more than a single page website, you can easily add-on services to give you more control over your website. Whether you know HTML or not, it’s easy to customize your website with POP! Choose from various website templates and add multiple pages with this easy to use drag-and-drop webpage editor. 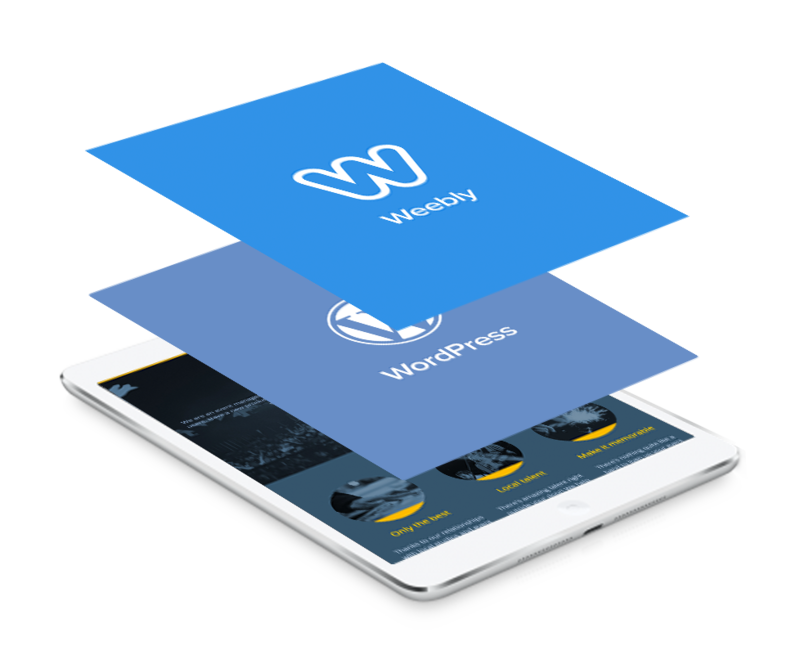 Weebly is a great choice for non-technical business owners who need more than a single page. You can even add e-commerce to build your own online store! If you already have a website built on another website builder or host, get full DNS access to connect your domain to a new site as easy as pie. More like, easy as eating pie. You’ll be able to connect your custom domain to Shopify, Squarespace, Heroku and more with a single click. No knowledge of technical DNS jargon required. We've been working with domains and websites for decades, so we're perfect candidates for giving you advise on which tools to build your website on. Our list of Simple DNS services is curated by web professionals, so use it as a starting point for picking your website's hosting provider. It wouldn't be called Simple DNS if it wasn't easy! If you have an existing site with one of our preferred website builders, you can use Simple DNS to point your domain at your hosting provider in seconds. We'll even show you the DNS records we're creating as well as any being removed in our confirmation step. When you activate a new Simple DNS service or create/update a DNS record, we begin tracking whether the record change has propagated to the rest of the internet (gone "live") for up to 24 hours. We use in-browser notifications to let you know when we think your changes are live. For services, we ensure all of the records have been updated at several recursive DNS servers. Already an expert? Advanced DNS is for you. We've got a few special features that will improve your experience. We fully support A, AAAA, CNAME, TXT, and SPF DNS records. We also support root domains, wildcard subdomains, and domain forwarding. Every time you create or modify a DNS record, we compare it against all other DNS records and Simple DNS services that exist for you domain. If we spot any conflicting records (one's that "overlap"), we ask you to resolve them before continuing. DNS can be tricky: root domains, wildcards, subdomains, trailing periods, SPF verification records. That's why we added a system to help you auto correct mistakes before they're saved. If you try to save a malformed record, Simple DNS nudges you in the right direction. That’s a lot of features included! Yeah, but that’s what POP is about. Making things easy so you get online and get going. So get going already!